Self-stirring cup, is the teaspoon dead? Posted on the Daily Mail on 16th April 2008 The humble teaspoon could be confined to the back of the cutlery drawer following the invention of a self-stirring teacup. The mug takes away the need to search for a spoon when making a hot beverage. The gadget was created by two French designers, who recently displayed it at the London Design Festival. 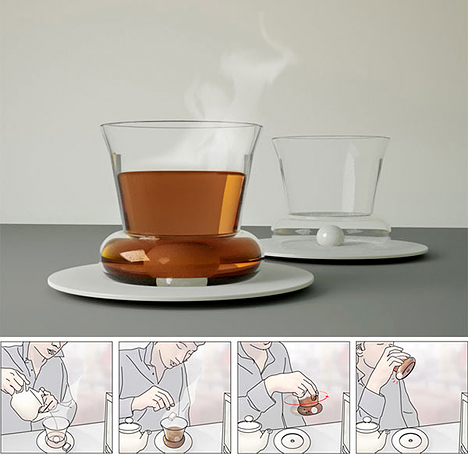 Designer Florian Dussopt, 23, said: “The cup aims at introducing a new way of drinking tea or another warm drink without using a spoon. Read more. This entry was posted on April 17, 2008 at 12:02 am and is filed under Uncategorized. You can follow any responses to this entry through the RSS 2.0 feed. You can leave a response, or trackback from your own site.